Seriously. This is every little girl’s wish come true – a real, live My Little Pony. Minus the rainbow explosion of color, disproportionately large eyes and endless silky tail. Fine, it’s My Little Pony – the Creepy Animals edition. 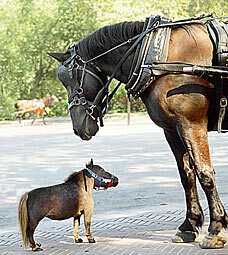 This diminutive horse – appropriately named Thumbelina – is a miniature of a miniature – she’s a dwarf Miniature Horse! The teensy creature is just 17 inches high and 60 pounds – barely larger than most dogs and supposedly much more feisty. I want one!! But how would I ride it? oh my gosh i want one too. its just too adorable. i would love it and pet and and call it my squishy!lol just kidiing but seriously though where can i get on1! I would like to know more about this particular horse.